On September 16, 1913, 12-year-old George Bernier of Mechanicsville, Connecticut, was attending the annual Woodstock Fair in the town of Woodstock. One attraction at the fair was to be a balloon ascension and parachute drop. As preparations for the ascent were being made, a call went out for volunteers to hold ropes attached to the balloon to keep it earthbound until the signal to let go was given. George was one of the volunteers who stepped forward and took hold of a rope. When the signal to let go was finally given, George released his hold, but the rope somehow became entangled around his left leg and he was jerked skyward as the balloon rose into the air. Despite shouts form the crowd of spectators, the man piloting the balloon seemed unaware of what was happening. As the balloon continued to rise, George was seen trying to grasp the rope with his hands, but fell away when the balloon reached a height of about 500 feet, and landed in front of the grandstand. 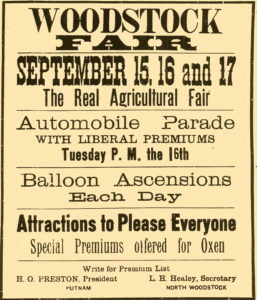 George’s parents sued for negligence, and filed suit against the Woodstock Agricultural Society and the balloon operator. The civil trial took place in the neighboring town of Putnam in March of 1914. Witnesses for both the plaintiffs and the defense testified, some among them had been standing nearby when George was swept upwards. Others included George’s cousin, Frank Bernier, and a family friend, both of whom had accompanied George to the fair, and one man who was an amateur photographer from Putnam, who happened to take a picture while the balloon was about 300 feet in the air with George dangling underneath. The photo was submitted as evidence. After deliberation, the jury found no blame with the Woodstock Agricultural Society or with the balloon’s pilot. According to www.findagrave.com, George is buried in St. Mary’s Cemetery in Putnam, Connecticut. Newspaper accounts gave his age was 13, but testimony given by his mother at the civil trial stated he was 12 years and nine months old.